The Parish House Apartments provide 6 one-bedroom units of permanent supportive housing for adults with intellectual and developmental disabilities. 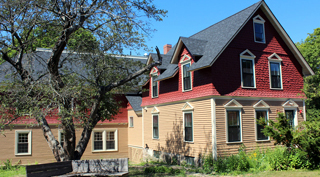 The home is located in a renovated historic building in the heart of downtown Bar Harbor, Maine. Parish House provides 24-hour supervision by trained support staff to help create a safe and stable living environment while helping residents develop self-reliance, confidence, and a sense of personal dignity. Supports are individualized to meet the person’s needs and expectations, enhance independence, and conducted in dynamic, positive learning environment. For more information please contact Julie Dufour at 207-852-8806 or email her at julie.dufour@voanne.org.